Crush the garlic cloves with a mortar and pestle. 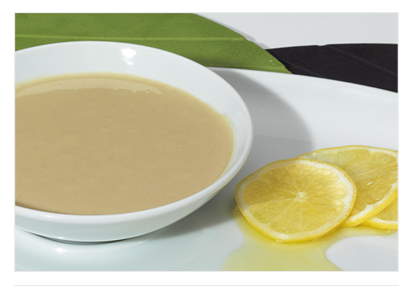 In a bowl, dilute the tahini with half the water and add the lemon juice and olive oil, mixing well. Add the crushed garlic and salt and pepper. Add the remaining water until the mixture is smooth and creamy. Garnish with a few parsley sprigs. It can accompany meat dishes, or it can be eaten on its own with a pita or unleavened bread.